In this day and age of big political winds of change trying to blow away both regulatory requirements and the documentation backing them in Washington I wonder just what will be left for review and reflection down the road as future decisions are made about ‘pesky regulatory requirements that hamper the ability of industry to function and prosper’. That may be what is desired by industrialists and those they can buy but from a historical perspective, at least, it makes it difficult to trace the development and evolution of society and culture. Back when Digital Cameras began to take off and replace Film someone opined that future archivists and historians looking back will see a dead zone beginning with the rise of the Digital Camera because most of the pictures taken with them never get printed so there’s no physical artifact to store away somewhere the way film photos have a film at least. To some degree this is correct – how many people migrate their growing collection of digital media from drive to drive as time goes on? And those photos that were on that lost or damaged drive and only there – gone forever most likely. – I generate a lot of photos and videos – more than the average person by far. – I’m involved in a number of history related efforts in the area I live in, most recently as President of the Boundary Historical Society but I also volunteer and work with the Boundary Museum and the Community Archives. – Every week I reproduce the two weekly newspapers from 106 years ago. – And finally I am the semi-official reporter and recorder of city council meetings in my town. And I put them all up on YouTube – thank you to Google for making that possible. It is while wearing the hat of this last item that I write this opinion piece. I do remember sitting in front of the TV as a child watching Sunday weekend roundup in Washington shows – can’t say why but they just held my attention. Might have been the oratory and passion, might have been the ideals. And as an adult I’ve found myself in a similar position due to a role I’ve had for the past 11 years; that of broadcaster of city council meetings. I’m not a member of council or staff – more of their most loyal viewer in a sense. I’ve been at every council meeting since 2006 with only 2 or 3 exceptions. And since 2011 a lot of those meetings have been recorded on the web. Now here’s the historical thing about city council: there are official minutes, there are my recordings and there are news media recordings and reporting. The official minutes do not record the minute details of discussion of things – generally it is a glossing at best with the essential details the only things recorded with fidelity and precision. What the motion said and how the vote went at the minimum. Because of that brevity you have to look to the media for more detail about what took place. The newspaper and radio reporters may bring their own audio recorders but they only share parts of what they get and usually a report on it – not the verbatim content. For that you have to go to my recordings. Both the commercial entities and myself are ephemeral entities – we could ‘go away’ at any time and take all our files away with us. And that would mean the community, and any future historical researchers, would be the losers. It’s not the ending we would want and likely there would be a transfer of material if desired before dissolution. But events can transpire that foil our plans . . . so the archivists would be left with records kept by city hall. This year City Council debated two changes to the way they do things that I’ve spoken against. (I can do that in the Committee Of The Whole meetings where the public can take part in the discussion and in the question period of the regular meetings). The first had to do with a Code of Conduct. Essentially putting limits on how passionate or heated a discussion can get. Not germane to this article. The second has to do with the Minutes and how they are recorded. Specifically the change is the remove the identification of who Moved and who Seconded a motion. So that the Motion and the voting results would be recorded but not those two items, Who. There were several reasons cited in the proposal and they tend to sound reasonable . . . but from a Historian’s point of view it’s a lessening of the data preserved for the future. Let’s say I’m trying to compile a history of the life of a prominent person who lived here and made contributions to the community over the years. During the time they spent on council I’d know what was before council, a distillation of the talking points and how the vote went. Instead I see an example of how to say what happened in 250 words or less. The spirit and words and actions are mostly stripped away. The passion is baked out of it leaving the product of a body bereft of the attribution of who began and supported the topic to begin with. Considering the rancorous history of this council in particular the contrast between life history before and after with the part in council might be stark. We show how X was passionate about all these things and their creation and execution but there’s this period where X is part of an entity that prefers to be seen as a neutral body with no individual parts. So almost nothing X said or did gets much mention in the official record. Except where X voted and some salient spoken points are noted. All the rest is dross. Not even fit to toss ‘cuz we didn’t deign to record it in the first place. One of the points made in the proposal is it works against Grand Standing. Because we don’t want that in local politics . . .
Let’s address that, Grand Standing. What is it? Why it is MAKING YOURSELF MORE NOTICEABLE THAN THE REST by standing out from the rest in some way. Taking an opposing stance and making a show out of it. Making a bold proposal and giving a big sales pitch to get it on the table (in the way that best ensures others will look like ogres if they speak against it). It’s Politics. It gets in the way of getting things done. But it’s Politics. They are Politicians. At least some of them are . . . others are there because they really want to serve their community without the politics being a blockage. But it’s a Political arena, isn’t it? Personally I think it gets in the way – but that’s me. At least we don’t have partisan politics in our city hall – yet. But I digress . . . Without this information history becomes a little less clear to those who come later. UPDATE:at the October 30th meeting council decided against adopting this change. 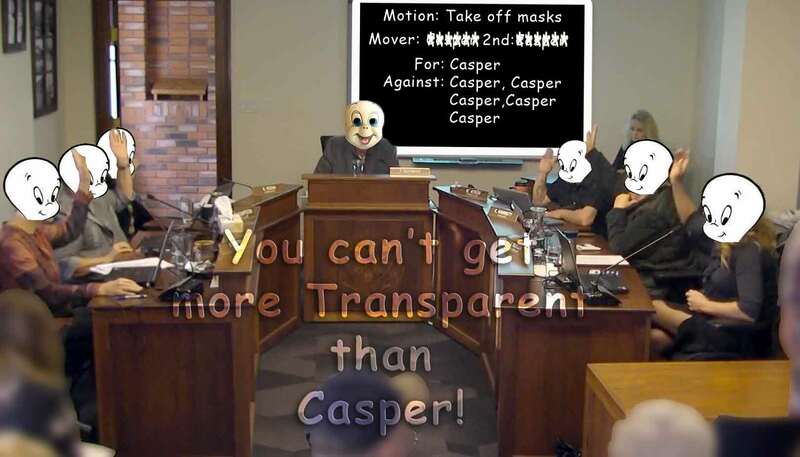 So you will still be able to see who moved and who seconded motions in council. This entry was posted in Editorial, History and tagged city council, Minutes on October 18, 2017 by gftvboss. After nearly a month hiatus (UBCM happened) City Council resumed meetings, on Oct 16. A Committee Of The Whole meeting followed by an In-Camera meeting and then the regular meeting in the evening. The COTW meeting saw a number of delegations with presentations. Both gallery 2 and the Boundary Museum came to present quarterly updates. gallery 2 brought along their new director for introductions. 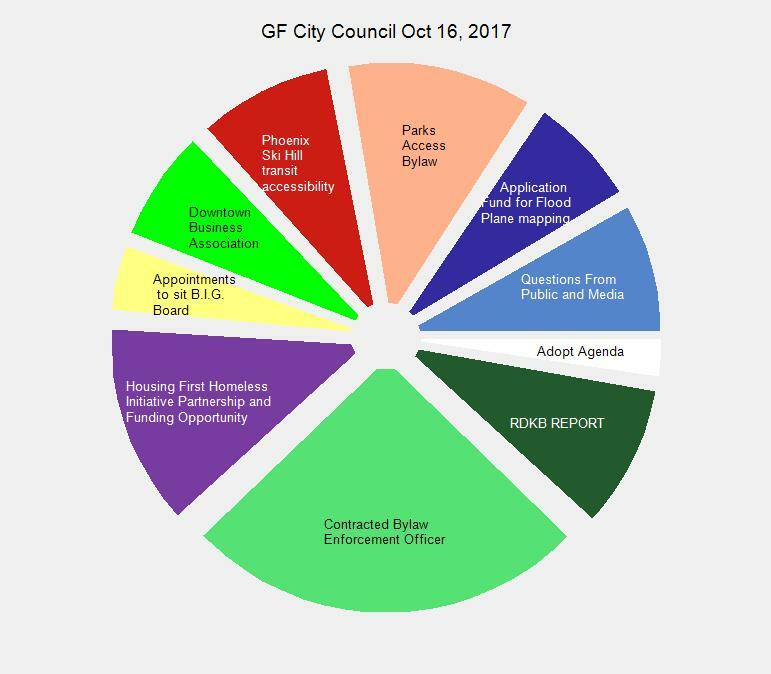 A presentation was made to introduce council to the sport of disc golf with the hope that the city would be amenable to making some city park space available for a play space. The Women’s Coalition came to ask the city for a letter of support. There’s possible funding to get working on tackling the problem of homelessness with the approach of Housing First. And there is a filing deadline of Oct 20 – just 4 days later. There was a presentation and a lot of discussion. For a simple ask of just a letter of support there was a lot of talking. 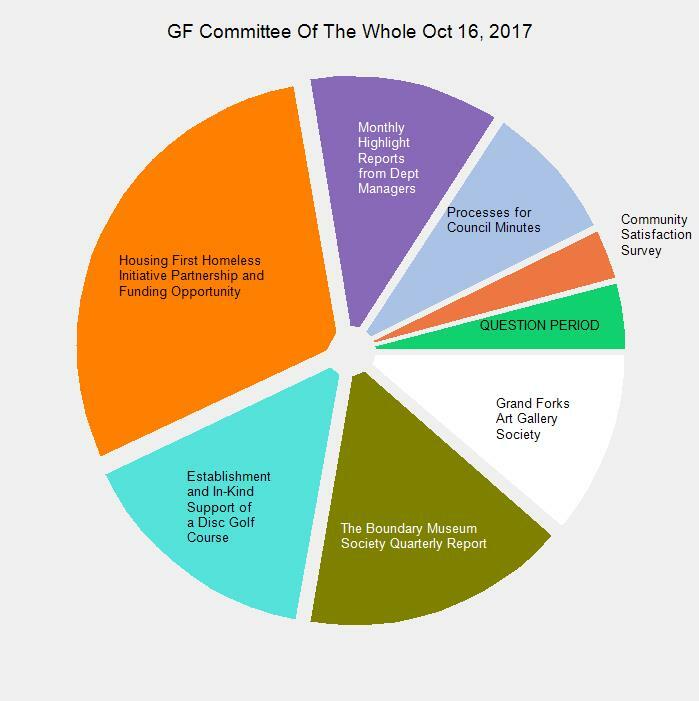 Which could be expected considering recent actions this council has taken in dealing with the problems of homelessness. At one point the Mayor says ‘it almost seems hypocritical that we are . . .’. I will let you make up your own minds on that if you care to watch and listen to the Housing First part of the meeting. NOTE: The image below may say Sept 5 but the video that plays is the Oct 16 COTW. This entry was posted in City, government and tagged city council, cotw on October 18, 2017 by gftvboss.